Ed Sheeran has achieved his first US number one album and, along with fellow Briton Sam Smith, has notched up a rare chart feat. Singer-songwriter Sheeran is at the top of the Billboard chart with second album X, while Smith has managed to hang on to the number two position for a second week with his debut release In The Lonely Hour. It is the first time UK solo acts have taken the top two places in the US album chart for 21 years, with Eric Clapton's Unplugged and Sting's Ten Summoner's Tales the last to do so. 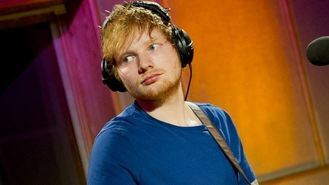 Sheeran topped the album chart at home on June 29, with the UK's fastest seller of the year so far. And this week music streaming service Spotify announced that X had scored the highest ever number of streams for an album in the UK in a single week, surpassing Daft Punk's Random Access Memories. The last time two UK acts took the US top two was in October 2012 with Babel by Mumford And Sons and The 2nd Law by Muse leading the pack, according to music trade magazine Billboard. Sheeran and Smith's albums are also at numbers one and two in the UK. Disclosure have hinted that they could be collaborating with Usher. The Last Shadow Puppets stars Miles Kane and Alex Turner are writing a film. Ariana Grande is way out in front to top the singles chart this weekend as online streaming counts towards sales data for the first time. Sam Smith has admitted he has been struggling to find love, despite going on plenty of dates. Ed Sheeran has seen the biggest increase in Spotify streams of any act who appeared at Glastonbury over the weekend.